The numbers game: Ramanujan prize-winner Sujatha solves math problems on paper. I have become obsessed with mathematicians. I see them as rare creatures—all the more inspiring because they toil in a field that is completely above my comprehension. Actually, ‘toil’ is the wrong word. As J.H. Poincare of the famous Poincare’s conjecture said, “The mathematician does not study pure mathematics because it is useful; he studies it because he delights in it and he delights in it because it is beautiful." Consider Ramdorai Sujatha. Winner of the 2006 Ramanujan Prize given to young mathematicians in developing countries, Sujatha, 44, is an associate professor in the Tata Institute of Fundamental Research (TIFR). She works in the field of elliptic curves, which are now fashionable because of their applications in cryptology. Beyond that, I have no idea what elliptic curves are. Sujatha does, and someday I hope that she will explain it to me. 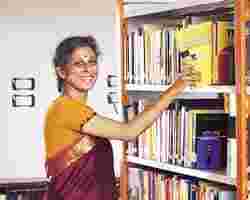 I read an interview she gave in Trieste, Italy after winning the Ramanujan Prize. When asked why young people should study mathematics, guess what her answer was? She didn’t say that math was an intellectually rewarding field; she didn’t talk about big salaries or making an impact on the world. She said, “…because it is so beautiful." Now, I know beauty. I have spent my life studying it. In my mind, beauty is above all relative. What one person thinks beautiful may not resonate with someone else. To prove this, I only need to point to national anthems. They move each nationality to tears, but have no impact on other nationalities. This is probably why I was surprised and fascinated when mathematicians kept talking about the ‘beauty’ of math; because math is about absolute, not relative, truth. If math was beautiful, then it contradicted everything I believed about beauty being relative. It took a Bertrand Russell to make things a little clearer for me. In his seminal book, The Study of Mathematics, Russell—who I consider one of the finest minds of this century—said, “Mathematics, rightly viewed, possesses not only truth, but supreme beauty—a beauty cold and austere, like that of sculpture, without appeal to any part of our weaker nature, without the gorgeous trappings of painting or music, yet sublimely pure, and capable of a stern perfection such as only the greatest art can show." Of course. Mention sculpture and I am won over. So this cold austere perfect beauty was what mathematicians were attracted to. There is a great website of math jokes hosted by Russian husband-and-wife mathematicians Elena and Andrej Cherkaev (www.math.utah.edu/ ~cherk/mathjokes.html). Reading this website is a great way for a layperson such as myself to access the mathematical mind. One of the sayings that resonated with me on this website is, “Mathematics is the language that God used to create the universe". I kind of agree with this. Nature is full of mathematical rhythms and symmetry. Here is one more from the math jokes site: A mathematician is asked to design a table. He first designs a table with no legs. Then he designs a table with infinitely many legs. He spends the rest of his life generalizing the results for the table with N legs (where N is not necessarily a natural number). Huh? Sujatha does a bit of this. She says that her typical day involves sitting at her table with a paper and pencil, working on a problem that she is trying to solve. Now let me ask you this: Who works with a paper and pencil these days? But most intuitive mathematicians such as Sujatha don’t rely on (and indeed don’t have much use for that poster child of 20th century invention: the computer). In fact, mathematicians say that the quality of a mind is inversely proportional to the space and equipment it requires. Unlike physics or chemistry and their aisles of solutions and equipment, the tools of a mathematician’s trade are simply his mind and maybe a pencil—isn’t that beautiful? A lone being confronted with a blank page. A single mind devising earth-shattering mathematical solutions. This has been a bumper year for Indian mathematicians. Srinivasa Varadhan, who teaches at New York University, won the Abel Prize, the math Nobel, this year. Varadhan works in probability theory. He calculates large deviations which, in my mind, is how to figure out the next earthquake or terrorist attack. I am probably wrong. I have emailed Professor Varadhan asking if I can read any of his papers in plain English. I await his reply. Akshay Venkatesh, also at NYU, won the Salem Prize this year for his work on the Fourier series. I think Indians have a natural inclination for math. As do Russians. I wonder how many great mathematical minds we have lost because we don’t have enough inspiring math teachers. I know that I for one was intimidated by math all through school. It is only now in later life that I am attempting to understand algebra and calculus…along with my 10-year-old daughter.